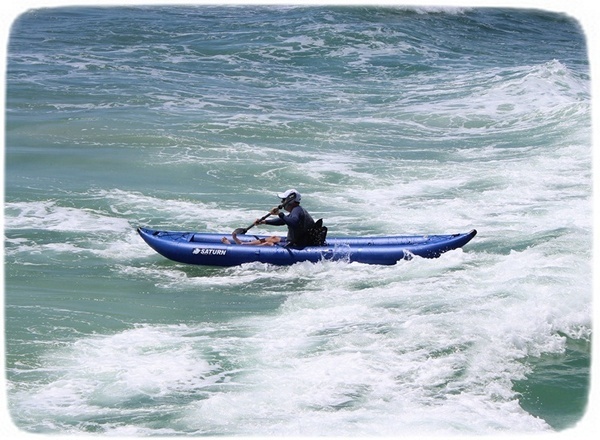 Taking on Waves in My Saturn Inflatable Ocean Kayak OK420. HomeBoatsToGo - Blog About Inflatable Boats, Inflatable Rafts, Inflatable Kayaks And More...Taking on Waves in My Saturn Inflatable Ocean Kayak OK420. 1. It can handle ocean waves. As I said earlier, I love the fact that I can use my new inflatable kayak out on the ocean. The reason the OK420 can handle this comes from its unique design. This amazing inflatable kayak has 4 self bailing openings along its floor, which allows water to escape without flooding the hull. That’s why it is able to handle the waves I encounter when I’m out in the ocean without any problems whatsoever. 2. This vessel is incredibly stable. With the thin design of inflatable kayaks, stability can sometimes become an issue. But not in the OK420, which has combated this problem by being built with 2 removable directional fins. With one fin in the front and one in the back, this inflatable kayak has incredible directional stability with virtually no seesaw action. It also has a catamaran-like hull that further increases stability while significantly reducing friction with the water. All of this adds up to a great ride! 3. My inflatable ocean kayak is super convenient. Another great thing about my OK420 inflatable kayak is just how convenient it is. I just quickly inflate it with the included high volume hand pump, and I’m off and paddling in no time. Then, when my daily adventure is through, I just deflate it and store it in my closet. That’s right! It is small enough to easily fit in a closet. That also means that it fits right in the trunk of my car, so I can take it with me anywhere I want. 4. The OK420 leads the pack in durability. One of the major questions I had about inflatable kayaks was if they would rip or pop during one of my journeys. With the OK420, this isn’t a concern. I mean, this boat is made up of thick, heavy-duty 1,100 Dtex High Strength PVC fabric coated on both sides. That makes it puncture proof, abrasion resistant, and incredibly durable. 5. It is very affordable. I bought my Saturn OK420 Commercial Grade PRO Inflatable Ocean Kayak online at BoatsToGo.com because, despite this inflatable kayak having a manufacturer’s suggested retail price of $1,198 (still very cheap in my opinion), BoatsToGo had it on sale for $599. Let me tell you, this vessel is very much worth this small price. I have not regretted buying it for a second!